We truly appreciate the support that Return To Your Power has given EQ and to prove it we're offering friends of Return To Your Power over $100 off your EQ Leadership Labs ticket. Join EQstl.com for our first ever conference on April 15th, 9am-5pm, at St. Louis Union Station. With a keynote presentation by Tim Sanders (author of the bestselling book, Love is the Killer App) and four tracks of education and inspiration, EQ Leadership Labs will be an incredible event and we'd love you to join us. "We’ve chosen the theme of leadership, because we believe that business owners, innovators, startups, and all the organizations that support entrepreneurship, are actively participating in a new culture of leadership that challenges traditional models of status, role, autonomy and accountability." 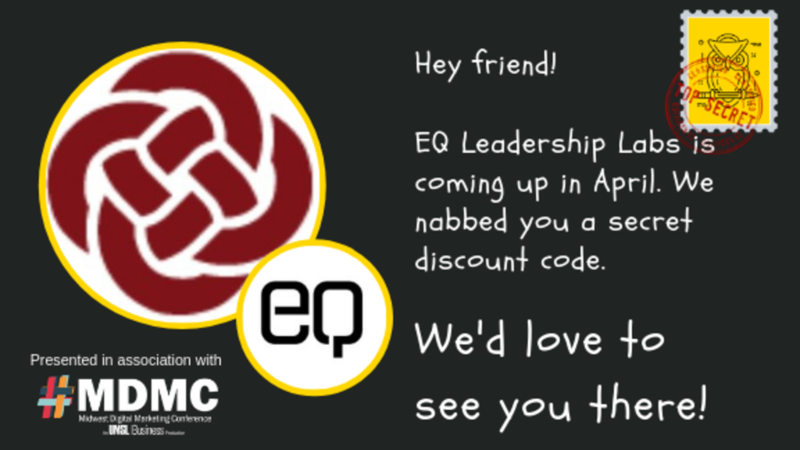 Register for EQ Leadership Labs using this page to claim more than 75% OFF General Admission tickets (full price normally $120). Full 1-day conference pass to the event on April 15th, 2019 at St. Louis Union Station. Conference Schedule: Doors open for registration at 8am. Full day agenda starts 9am and ends at 5pm. An EQ Community Network account profile. Membership to the EQ Community Network. You will have to create a password to purchase this offer. This will instantly create an EQ Community Network account profile and activate your membership. This is a one time purchase only and will not activate any recurring charges (as some sneaky subscription/membership sites do).